We’d love your help. Let us know what’s wrong with this preview of Maiden Voyage by Tania Aebi. To ask other readers questions about Maiden Voyage, please sign up. Is this book appropriate for a high school class? As a present for her high school graduation, Tania Aebi receives a 26 sailboat from her father with the admonition that she needs to sail around the world to increase her awareness of the world. This is the account of this voyage. I have read this book 2-3 times because I like sailing books. I've sailed around the world with 4-5 people over the years (from my easy chair.) I will read this again,. This is a re-reading of this book, perhaps the 3rd time. An 18-year-old girl is told by her As a present for her high school graduation, Tania Aebi receives a 26 sailboat from her father with the admonition that she needs to sail around the world to increase her awareness of the world. This is the account of this voyage. I have read this book 2-3 times because I like sailing books. I've sailed around the world with 4-5 people over the years (from my easy chair.) I will read this again,. This is a re-reading of this book, perhaps the 3rd time. An 18-year-old girl is told by her father to sail around the world on a 26-foot sailboat after graduation from High School. It takes her two and a half years with several stops, but she does sit. Why do I like this book? I think I like it because it is the human spirit that overcomes adversity. A little bit at a time. Sometimes she made 30 miles a day. We, too, build one day at a time. As she approaches New York, she takes down her sails and thinks about she what she has done. These are some quotes from the last part of the book. She had just sailed 49 days from Gibraltar to New York, during October and November on her last leg of her journey, 2 1/2 years. This is what she wrote: "Now, in the same spot as I had been as an eighteen-year-old, setting off on her maiden voyage, scared and apprehensive of the future. I realized that the future wasn't something to worry about. If living at sea had taught me anything, it had revealed the importance of taking each new dawn in stride and doing the best I could with whatever presented. . . . Isn't that what life is all about? to move forward and keep adding to the memories? " This book is so inspiring. I still find it hard to believe that Tania Aebi set out as an eighteen-year-old to circumnavigate the world. And she succeeded! Despite the fact that through this feat she definitely earned bragging rights, she is not braggy or boastful at all, but incredibly humble. She is very honest about her fears and feelings of inadequacy and, at times, her desire to quit. She is truly an inspiration to me! Additionally, I found the writing beautiful. She knows how to put togethe This book is so inspiring. I still find it hard to believe that Tania Aebi set out as an eighteen-year-old to circumnavigate the world. And she succeeded! Despite the fact that through this feat she definitely earned bragging rights, she is not braggy or boastful at all, but incredibly humble. She is very honest about her fears and feelings of inadequacy and, at times, her desire to quit. She is truly an inspiration to me! This was a fun adventure book that makes me want to feel the wind and spray on my face. This is more than an adventure story in that there are practical tips for anyone to learn that is out sailing the ocean. Also, there are at times philosophical asides that show Tania's growth from a rebellious teenager into a young woman that is wiser than her cohorts. This book is a memoir of the author's trip around the world, alone, in a 26' sailboat, the conclusion of which trip made her both the youngest person and the first female to circumnavigate the world alone. Tania Aebi was 18 in 1985 when she left New York on the sailboat Varuna, and that departure marked the first time she had ever handled a boat by herself. She (alongside siblings and family friends) had served as "crew" on her father's sailboat before, but he'd handled most of the actual work of This book is a memoir of the author's trip around the world, alone, in a 26' sailboat, the conclusion of which trip made her both the youngest person and the first female to circumnavigate the world alone. Tania Aebi was 18 in 1985 when she left New York on the sailboat Varuna, and that departure marked the first time she had ever handled a boat by herself. She (alongside siblings and family friends) had served as "crew" on her father's sailboat before, but he'd handled most of the actual work of sailing, so this trip really was, astonishingly, her maiden voyage. The whole idea had been her father's brainchild - worried that his daughter was squandering her life with no goals or direction, he made her an offer: either go to college, or let him use the tuition money to buy her a sailboat - on the condition that she spend the next 2.5 years sailing around the world, writing articles about her progress for the sailing magazine Cruising World. She chose the latter without any real conviction or excitement about the decision. In a way the book is a chronicle of growing up and coming into one's own, as the author grows from living out her father's dreams to developing dreams and plans of her own. Along the way the reader gets glimpses of many different ways of life (the sections about islands in the South Pacific were a fascinating supplement to other books I've read about those places), learns about sailing, and watches the author struggle with her mortality and fall in love. It's interesting on a number of different levels, human and geographic and technical. Aebi tells her tale well, being personal and confiding while avoiding the tendency toward self-absorption that infects so many memoirs. My boyfriend and I have been seriously discussing getting a sailboat and taking off to see the world, so naturally I've turned to one of my favorite hobbies - reading - to educate and inform myself on what doing something like that might actually be like. I was pleasantly surprised by this book. Although not instantly hooked in the beginning or even midway through, I stuck with it and ended up really enjoying Tania's story. The beginning is a bit choppy and the writing style takes some getting u My boyfriend and I have been seriously discussing getting a sailboat and taking off to see the world, so naturally I've turned to one of my favorite hobbies - reading - to educate and inform myself on what doing something like that might actually be like. I was pleasantly surprised by this book. Although not instantly hooked in the beginning or even midway through, I stuck with it and ended up really enjoying Tania's story. The beginning is a bit choppy and the writing style takes some getting used to as Tania jumps back and forth between past/present and many details aren't revisited until later in the book. Initially, this frustrated me, but as I made my way through the book things came together more. What stuck with me the most was Tania's coming of age and growth during her journey. Here's a girl just 18 years old with no real direction in her life given the opportunity to take off and sail the world for 2 years. Her father does sort of push this on her, but Tania makes the decision herself to go. She has little sailing experience and an incredibly faulty engine, yet she perseveres and accomplishes something many can only dream of doing. As time goes on, she has no choice but to confront her past, her relationships and life in general. She really matures and comes to terms with a lot throughout her journey and I loved reading about that. I guess confrontation with yourself is kind of inevitable when you're in the middle of the ocean all alone. While Tania is alone for much of her journey, she also meets countless fascinating people who help her along the way and provide support when she needs it most. She finds romance, friends and family along the way and is exposed to so many cultures and ways of life. I loved her description of the islanders during her time in the South Pacific and also her reaction to what it was like adjusting to Western culture again. So - why only 4 stars? While I loved this I did feel that the story was only told at surface level. Tania does divulge some details of her romance with Olivier and her rocky past with her parents, but I kept feeling like something was missing. What she discusses is of course very personal, but I felt like the story would have been stronger and I would have connected more had things not been so downplayed. I also kind of disliked Tania's father for most of the book - the whole voyage was his idea and it felt like he kind of pushed it on Tania as a way to live through her…it just didn't sit right with me. Just finished Maiden Voyage by Tania Aebi. It describes her solo circumnavigation starting at age 18 from New York in 1985 and finishing 2 years later in 1987. Zipped through the whole book in less than a day. Obviously a gripping tale. * She did it at 18 years old - holy shiny binnacles, Batman! * She did it on a boat that was only 26 feet long! * She seemed like Just finished Maiden Voyage by Tania Aebi. It describes her solo circumnavigation starting at age 18 from New York in 1985 and finishing 2 years later in 1987. * She seemed like a cat lover - she took along 2 cats! * I got through the whole thing in less than a day - I was riveted. * en route, she gave away one of her cats!! Yikes! Who could DO that?? I ended up liking this book a lot more than I thought I was going to at the beginning. The way Tania matured throughout the process was interesting and her way of giving credit to everyone but herself showed a level of character unusual for one that young (or any age). I kept projecting myself into her role and wondered how I would have handled the obstacles she faced when I was that age. I’m certain I wouldn’t have done as well as she did and I doubt I would have had integrity to handle the lon I ended up liking this book a lot more than I thought I was going to at the beginning. The way Tania matured throughout the process was interesting and her way of giving credit to everyone but herself showed a level of character unusual for one that young (or any age). I kept projecting myself into her role and wondered how I would have handled the obstacles she faced when I was that age. I’m certain I wouldn’t have done as well as she did and I doubt I would have had integrity to handle the long stretches at sea, the storms, near collisions with tankers and the constant mechanical problems with the boat. At the beginning I was a little put off by the romantic and family drama component but as the saga progressed I have to admit that the issues with her family became interesting to read because they were so out there. We’re not talking typical family dysfunction here. The romances with Luc and Olivier seemed like a crutch at times but by the end she displayed so much inner strength that her ability to problem solve and her sailing skills were on par with the boys and exceeded them in some cases. Taking on the challenge was not the smartest decision and she was lucky she made it but in the end, she pulled it off and deserves praise and admiration for it. I received this book as a gift my senior year of high school from the teacher who supervised our literary magazine. I read it back then and loved it. From that reading, I mostly remember descriptions of the author sailing into foreign ports, hanging out with fellow sailors, and eating fruit. It made me want to follow in her footsteps. This time around I noticed things I didn't pay attention to the first time. The way her father manipulated her into this "adventure." The way, after she begins her I received this book as a gift my senior year of high school from the teacher who supervised our literary magazine. I read it back then and loved it. From that reading, I mostly remember descriptions of the author sailing into foreign ports, hanging out with fellow sailors, and eating fruit. It made me want to follow in her footsteps. Maiden Voyage is a true story of a young woman's adventure sailing solo around the world at the age of eighteen. Not the kind of book I would normally pick up, I couldn't put it down. 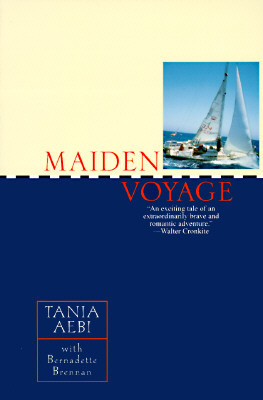 More than a tale of adventure and courage on the high seas, Maiden Voyage delves into the dynamics of Tania's fascinating family, the struggles in her heart, and the drama of falling in love, all portrayed with poetic sensibility and literary integrity. Great book and it has helped me in deciding where I should go when I circumnavigate the world in a sailboat with friends in a few years! Sailors will enjoy this one. I came away grateful that my sailing dream includes a partner. This was one tough adventure! As the proud keeper of a Contessa 26, how could I not be enchanted and mesmerized by this wonderful tale of circumnavigation. Recommended reading. Loved it! I want to sail the world now! Well, maybe not but it's a truly inspiring book that makes you want to experience more out of life. As nautical recounts of single hand voyages go, this was refreshing and delightful. this is on my "top books ever read" list. I mean, it is a true story... and unbelievably adventurous! In a Monte Carlo simulation, usually done with computers, a scenario with complex inputs is run through many times with randomized parameters to estimate the percentages of possible outcomes. This is done when solving the systems in any analytical (i.e. on paper so to speak) way is just impossible. "Maiden Voyage" is one outcome of a real life Monte Carlo simulation where Tania Aebi did not meet an unrecoverable disaster. What we are missing are the 999 out of 1000 Tania Aebi voyages that did suc In a Monte Carlo simulation, usually done with computers, a scenario with complex inputs is run through many times with randomized parameters to estimate the percentages of possible outcomes. This is done when solving the systems in any analytical (i.e. on paper so to speak) way is just impossible. I really loved this book. I think her story is very inspiring and the way it's written made me not want to stop reading the book. I'd recommend this to anyone who loves adventurous travel literature with a pinch of romance. Loved this book...infact i have read it a couple of times over the years. A true story of a couragous journey. If you like ocean adventures.... you gotta read this one. I really enjoyed this book. It made me want to buy a sailboat and learn to sail. I figure if she can do it so can I. Good read - well-written book, but I wanted more details. The parts where she discussed her family and her mother specifically were so fascinating. I definitely wanted more details. Amazing inspiring story, I love how she writes about not only the sailing around the world, but also about her life and the troubles she faced growing up. If you're interested in sailing this is a great read. What at achievement! She sailed around the world in a Contessa 26 and we have just bought a Contessa 28. I doubt if we will sail so far. Nederlandse titel:Solo. Echt een inspirerend reisverslag van een jonge vrouw. Je zeilt echt mee. So, I enjoyed this story, for that is what it is, a story. I have to take with a grain of salt the memories of over 30 years ago for it to be autobiographical. The author is around my age, and I can tell you, I could not describe to the detail this book has of her travels of my life in the 80's. But I did enjoy the book. I do have to say I feel no love for her father in anyway. I feel her dad's way of dealing with how Tania rebelled in her teen years, which was a normal reaction to her parent's i So, I enjoyed this story, for that is what it is, a story. I have to take with a grain of salt the memories of over 30 years ago for it to be autobiographical. The author is around my age, and I can tell you, I could not describe to the detail this book has of her travels of my life in the 80's. But I did enjoy the book. I do have to say I feel no love for her father in anyway. I feel her dad's way of dealing with how Tania rebelled in her teen years, which was a normal reaction to her parent's inability to deal with their personal life and drug their kids through custody hell, was irresponsible. Regardless of how he was raised, old Northern European style, it is not an excuse in 1980's America. The tough love approach almost killed his daughter, in the first week alone. That and the fact that he set his daughter off on a solo journey at 18 with little to no experience in a boat that was not tested was almost criminal. I don't know much about sailing, just what I read. However, I do know that the boat should have been run through some sea trials. And his ability to jump on a plane at the drop of a hat at last moment to either meet her at a port (at least 3 times) or go off on a race on his own, just seems fantastical to me... or they are a wealthy family and it just isn't brought up. Based on how her parent's seem to drag the kids to Europe and back makes me think they had a lot of money. The journey itself was fascinating. I've read other sailing and if anything it shows how the sailing community does take care of its own. Read it for what it is - a good sea yarn. At the age of 18 she set off from New York on a solo circumnavigation of the globe in a 26 foot sailboat, Varuna. She returned at the age of 21 and Maiden Voyage is a memoir of her solo trip around the world. Upon her return she married Olivier, a fellow sailor she met on her trip. Although they would later divorce, she went on to raise two sons with him, earned her BA and MFA, as well as her capt At the age of 18 she set off from New York on a solo circumnavigation of the globe in a 26 foot sailboat, Varuna. She returned at the age of 21 and Maiden Voyage is a memoir of her solo trip around the world. Upon her return she married Olivier, a fellow sailor she met on her trip. Although they would later divorce, she went on to raise two sons with him, earned her BA and MFA, as well as her captain's license, and continued to sail both with her family and leading charters, and continued to write. In 2005 a collection of Tania Aebi's columns from Latitudes & Attitudes was published as I've been around.